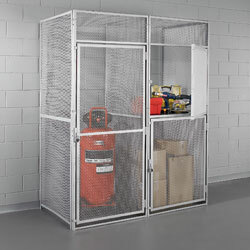 Heavy-duty, open wire storage units protect valuables while allowing full visibility and unrestricted air, light and heat flow. Modular design makes enclosures easy to install and relocate. Doors include welded padlock hasps. Panels feature pre-punched holes for easy installation with nuts, bolts, and hand tools. Basic hardware included. Double-tier design features non-removable reinforced center shelf. 7'6"H overall. FACTORY QUICK SHIPFOB TENNESSEE.